The first open bottom ("tuning fork", as some call it) shield hauling trailers by Uintah Machine were built back about the mid 1980's. We don't know of any that were ever built before these. Since that time we have built dozens of variations, some with open bottom, some with liftable pans, some with winches, some without, some diesel powered, some trailers, some tall and narrow, others lower and wider. We can build some for you. 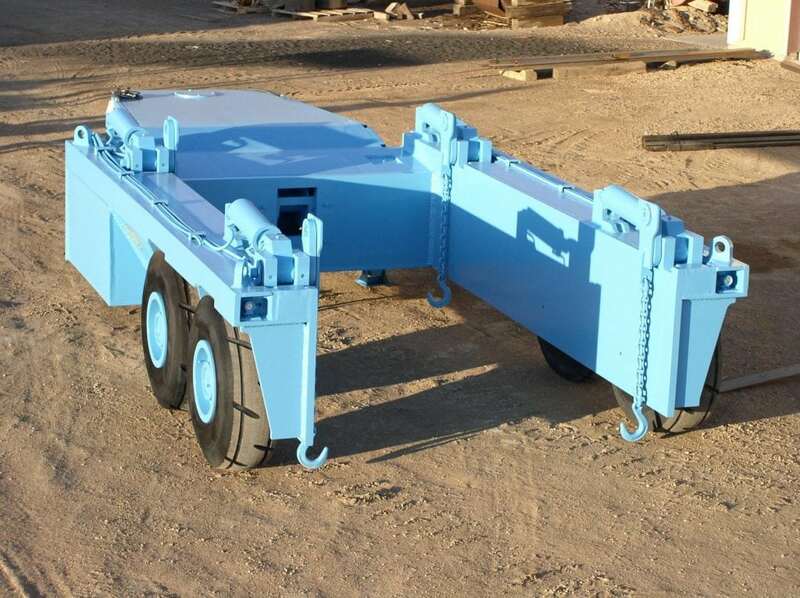 Uintah Machine's basic shield hauler models are open-bottom, open-back trailers fitted with hydraulic cylinders and heavy chains. The shield fits inside the “horseshoe” and is lifted and carried with the cylinders and chains. Shields can be hauled through the mine only inches above the ground with their centers of gravity between the wheels on the shield hauler. They are the fastest way to move shields long distances. Our unique, rugged design saves thousands of dollars in wear and tear on forked or "cookie sheet" shield movers and tires. In fact, our longwall shield haulers have been known to pay for themselves in one long wall move in tire savings alone. Other custom shield hauler variations include heavy-duty oscillation plate suspension for a smooth ride, load equalization on the tires, and optimum braking performance. Uintah Machine has developed multiple disc wet service brakes for improved braking power. They fit entirely within the wheel and do not add to the overall width of the machine. These features can be applied to almost all Uintah Machine's shield hauler models. Another optional feature is a lifting pan with a hydraulic winch for loading and a hydraulic push plate for unloading. The pan sets flat on the ground for loading, with the shield being pulled in by the winch. The pan is lifted hydraulically and carried a few inches off the ground. For unloading, the pan tilts down at the rear allowing the shield to slide out with aid from the push plate. Nylon pads protect the shields and lifting pans from abrasion. Uintah Machine also manufactures self-propelled shield haulers built integrally with the power unit of your choice. They can be built on Wagner 14X and 20X machines, Getmans, Jeffrey RamCars, and more. We can also build on Uintah Machine’s own Part 31 permissible tractor based on the permissable coal haulers we build. Uintah Machine has built many custom shield haulers. We mostly serve repeat customers and have caught the attention of mining companies internationally. We take pride in our work, and you can count on receiving the highest-quality, lowest-maintenance shield hauler available. Our customers have always been happy with our quality. Uintah would be pleased to design and build a shield hauler to meet your specific needs.